Gunlord is the latest independent Dreamcast release from NG:Dev.Team; infamous developers of such Dreamcast shoot-em-ups as Last Hope, Fast Striker and DUX (which was released under the Hucast banner). This time, NG:Dev.Team are trying their hand at a more traditional action game but with a unique shoot-em-up twist. Gunlord follows our hero Gordian Gaiden as he fights the evil forces led by The Master. Gordian is desperately searching for his wife Vanessa who went missing along with her ship, the Z-42 Warpstar after a dramatic battle with the Evil Empire. As per usual, the story is merely in place to keep the action flowing and takes a back-seat in order to not intrude. The opening cutscene is a purposely camp homage to bad Japanese-to-English translations (or Engrish) and features some fantastic artwork that sets the scene for the game. 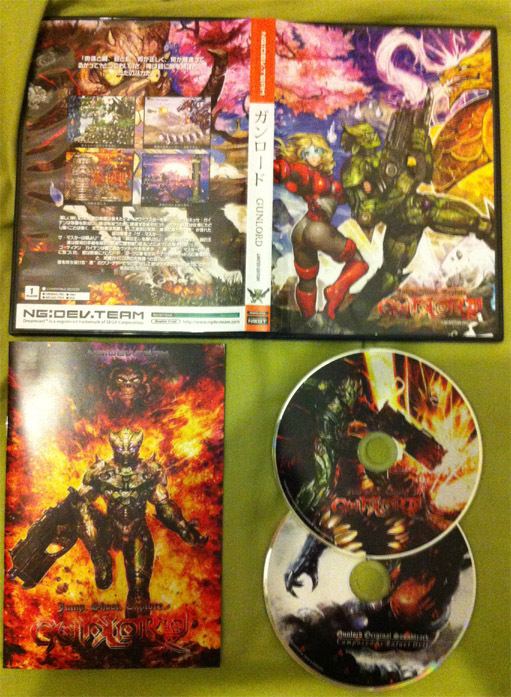 Once the action begins you will realise just how consistent the artwork really is. Each stage is full of dramatic and detailed scenery that is complimented even further with super-slick animation and special effects. Gunlord is one of the best looking 2D action games available on the Dreamcast and is a fine addition to NG:Dev.Team’s already fantastic looking library. 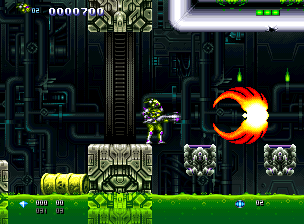 Gameplay should be familiar to anyone who has experienced Manfred Trenz’s seminal Turrican series. 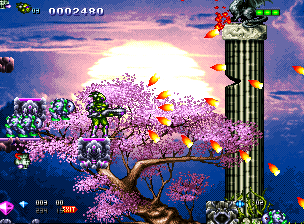 The action stages play identically to the Turrican games complete with wheel and bomb attacks, standard shots, a snakebeam and superwave attacks. Gordian is a joy to control and his movement is very natural and responsive thanks to the games consistent 60 frames-per-second framerate. The only real shame is that NG:Dev.Team have done very little to differentiate the gameplay from the Turrican series and give it its’ own identity. Now here’s where things get a little more interesting; after every Turrican-esque action stage follows a more familiar NG:Dev.Team shoot-em-up stage. 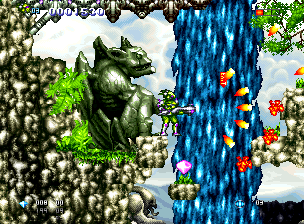 These stages borrow elements heavily from the Thunderforce series but don’t feature any additional weapon power-ups. They are simply fast shooter stages with a relentless amount of enemies and a boss which will test your piloting reflexes and ability to read the enemies’ attack patterns. These stages thankfully make up for the lack of innovation in the action stages and keep the game’s pace incredibly high. This really is a relentless piece of action gaming that will test even the most experienced gamer’s skills. Outside the main game there is little else to do. An arcade mode simply removes the cutscenes and gets the game flowing faster for a more score-based experience. The big downside to Gunlord is its’ lack of a save feature for those who simply want to see the whole game in more than one incredibly long sitting. The game is purely focussed on high score gaming and only saves to the VMU to store any successful scores you have entered upon dying/completing the game. This wouldn’t be so bad if Gunlord wasn’t so challenging. Without the ability to change difficulty levels, you are thrown into a difficult game with no other option then to plough through and stop being a baby who can’t save his progress. For those who like a challenging experience this needn’t matter too much, but it’s still a shame that casual gamers weren’t catered for as well. All in all, Gunlord is a fine addition to the Dreamcast’s library and long past any of the console’s official support. Fans of the Turrican and Thunderforce series’ will feel right at home with the game’s action and they’ll also be treated to some rather fantastic artwork. It’s just a shame that a lack of a save feature and changeable difficulty settings limit the appeal to a wider audience.